Rachel Lynn Solomon is the Queen of Bittersweet Heartaches. After reading her debut, You’ll Miss Me When I’m Gone, I understood Rachel as the kind of author who never shy away from writing on tough subjects. I am drawn to the author’s work for her ability to depict raw emotions – emotions that we would be too embarrassed to admit. Although many of these may seem the average problems of growing up, Rachel Lynn Solomon handles the emotions with respect. She shows readers how emotions like jealousy, anger, frustration, confusion are opportunities for growth. In her books, her characters are never minimized for their mistakes but rather find meaning in them. Rachel’s books do just that. 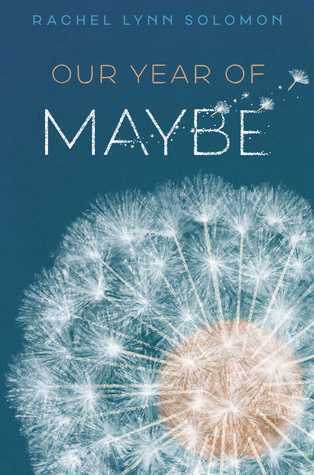 Reading Our Year of Maybe was a beautiful experience that taught me so much of my own expectations of what friendship should be like. Codependency and toxicity among friends is an important discussion. It is often that friendships can be the beginning and end of their world. When it is so, we can often forget where the line between taking care of ourselves and being someone’s friend. Often times we may not even realize the extent of the toxicity and/or codependency. What I appreciated about how the author wrote it is that she did not demonize Sophie or Peter. To shape her characters into mature people, Rachel had to expose the ugliest parts of Sophie and Peter’s relationship. Here is what Our Year of Maybe taught me: no one person is the source of my joy. People are allowed to love and laugh with others. It is not a measure of my own worth as a friend. When we first meet Sophie and Peter, their entire lives revolve around each other. So when, after the surgery when Peter begins schooling, there is a shift in the balance of their world. It forces them apart. It’s at this point that Sophie and Peter, away from the other, begin to explore their identities. Peter “breaks away” to explore his sexuality and his passion for music. This is a very important point because it shows us that it is okay to step away from friends once in a while, that to explore and create your own world does not mean the other is not important. One of the hardest lessons of life is jealousy. It’s not something we can ever truly avoid but it is a great teacher. In Our Year of Maybe, Sophie is confused and hurt by Peter’s “new life.” She doesn’t understand why she cannot still be a part of his world. As pernicious as jealousy is, it is also a good teacher. Jealousy happens when a need is unmet. For Sophie, all her decisions were made for Peter’s benefit so much so that when he got healthy she expected the same from him. But in order to be herself Sophie had to let go of Peter. She had to step into a world where he is not. Jealousy and one’s understand of its roots is an opportunity of growth. Rachel Lynn Solomon’s books are a testament of human nature. The complexity of her characters creates a deep empathy among her readers. She depicts human experiences and human emotions to create a charming story of family and love. [spoiler] Although we do not know if Peter and Sophie will remain as close as they were, and though it pained me to read it, I was accepting of it. [spoiler] Because we have to understand that people come into our lives and people leave, but the space they occupied in our lives will forever be changed. How we choose to decorate that space is up to us. What’s your favourite book about friendship? Have you read any of Solomon’s books? Thank you to Simon & Schuster and Rachel Lynn Solomon for providing me with a digital review copy in exchange for an honest review! Follow the rest of the tour over at Fantastic Flying Book Club! This sounds really good. I saw it the other day on Goodreads (or another blog, who knows) but, for some reason, didn’t actually look into it, and now I’m like, “CLEARLY, you made a mistake in not reading the synopsis!” and, in short, I’m completely sold. What a lovely review. I am really intrigued now as I’m getting vibes of strong characterisation as well as a deep exploration of what makes us tick and how we process or rather don’t process our emotions. I am making a note of this book, thank you! “strong characterisation as well as a deep exploration” is definitely how I would describe Solomon’s books! I really hope you pick this up as it’s a very good read!